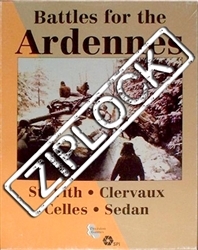 Battles for the Ardennes simulates the campaigns that marked the first breath and last gasp of the Nazi war machine in the West on four comprehensively illustrated maps, used separately for individual battles, or linked together to re-enact the entire campaigns of 1940 or 1944. Colorful cardboard playing pieces accurately reflect the size and strength of military units actually involved in these battles. These counters also represent march modes, blown bridges, improved positions, air power and supply. Their movement, positioning, and engagement for battle are regulated by a superimposed hexagonal grid. Simple probability chars reveal each combat's outcome. 1940: "A sector that is not dangerous. It is impenetrable". That is how the French military described the Ardennes Forest. In 1940, the German Blitzkrieg proved otherwise. 1944: "Home by Christmas." This was the motto American GI's voiced in light of Wehrmacht's bear collapse. In December, 1944, many a voice was stilled. These four games (St. Vith, Clervaux, Celles and Sedan 1940) can be played individually or as two campaign games (1940 Blitzkrieg to the Meuse and 1944 Battle of the Buldge).